My wife is trying to get in shape and actually suggested going on jogs! Not as good as riding but better than nothing. We have been doing 1.4 miles at a time. We do a loop around the park a block from the house 4 times. Today was the 3rd day in a row and the 5th in the past couple weeks and she finally made it the whole way without walking breaks. I think she could have done it the first try but I think its very important to not push it right away for mental reasons and even just to feel out how the body is dealing with it. I just give a bit of encouragement, some form and breathing tips, silent company mostly, and keep track of the pace so she feels good after yogging faster each time. Today she did 11:08 pace. I'm debating if the next step is to add distance but put back in a walking break, or to keep the same distance for a bit til its more comfortable and work up to 10 minute pace first. Probably doesn't matter except for whatever is more motivating - I would lean a tad more distance first (time practicing form, accommodating) but I think she likes that it doesn't take too much time, and would feel more comfortable going a bit faster. Would a decent "aerobic fitness" oriented goal be like 4 miles at 8 minute pace maybe? my advice? let her lead. it's her exercise time. don't make it training and don't coach or advise unless specifically requested. treat it as together time to talk about anything other than the jogging you're doing. Pro tip- notice how the tendencies that manifest in your exercise sessions manifest in other parts of your relationship. I sure can tell my wife how to drive. Which considering she runs the marketing department for one of the largest health systems in the country is absolutely brimming with irony. Have to do a walls out restoration of the bike room due to sewage contaminating floor, sheetrock, ceiling. All furniture will be trashed. Trainers, rollers, my playstation driving seat and driving controls, some other stuff saved. Limited budget but I'm thinking of building a built in wall unit with space for a screen, a big tower PC (for Zwift), playstation shelf, speakers (big ones, with an amp). 1. Keyboard that is accessible from the bike. I had a shelf sticking out perpendicular to the shelf but it wasn't really ideal. 2. Usable driving seat (it's sort of 1/3 of an open wheel race car body so not just a seat) with screen at right height. 3. Doors to cover screen when not in use. 4. Not sure if rug or tile. Thinking inexpensive linoleum one sheet "tile" with exercise mats on top. I had previously covered the floor with exercise mats. 1. Get a cheaper 40" TV. Not sure if I can rig something to drop it 12-18" lower so it's usable with the car seat as well as with the trainer. 2. Some kind of drawer system that extends 3-4 feet for the keyboard/mouse. 4. Easy way to switch headphones/speakers. Goal is to spend about $500-800. Floor/ceiling/sheetrock will be covered by insurance, so this budget would be for TV (or large monitor), drawer type hardware, maybe TV mounting hardware, and cabinet materials. Any thoughts, suggestions, etc, welcome. First investment is a fan. Like a really good one. I get by with a box fan but would love to spend some money on a High Volume - low speed fan. Throw in some Horse stall liner (or other Heavy rubber matting) to deaden sound and reduce vibration and I think that's what I would mostly want. Also, make sure your floor is dead level. After my experiences with a slightly askew trainer in the past, this is paramount. I spend a lot of time trying to get this right. Not willing to take that injury risk again..
has anyone here done the river gorge omnium in georgia? I love how "race sim" keeps intruding. That's exactly what I want with the Playstation + seat set up. I have a huge fan, crazy CFM, so much so that it can keep me cool until the air is physically unable to take more moisture (80 deg F, 80% humidity, seems like). I'm eyeing IKEA units, wall mount (off the floor because never know), to hold monitor (aka flatscreen TV), tower desktop for Zwift, speakers, etc. 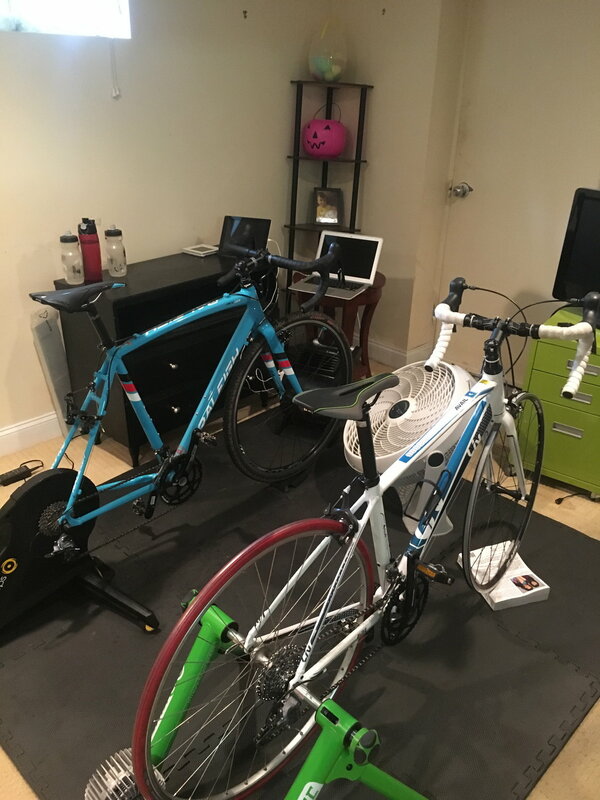 I have rollers, trainer, rocking trainer, and a fixed gear spin bike, would like to have something where I can rotate them around somewhat easily. Room is tiny, maybe 12'x12', so not much room. Three doors (closet, hallway, another room), two of which open regularly. I'm probably going to run a network cable down to the room, although I don't experience many network drops. I forgot to say the floor was covered in wall to wall carpet. Would like to not go back to carpet, to do a one piece linoleum instead. Noting the importance of level, would spring for leveling the floor first. I'd cover it all with exercise mat stuff. I had interlocking stuff but it got ruined, all has to be replaced. Front view - missing a shelf sticking out from the baker shelf holding mouse. Laptops replaced with keyboard, PC is in shelf. 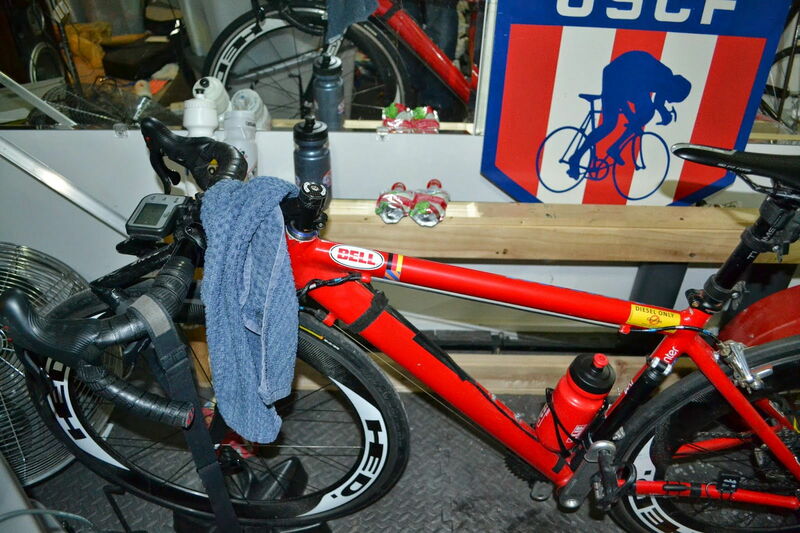 Red bike on trainer, motion rollers against wall. I don't know how much I'll end up paying of it, or what the insurance company will pay, but I just looked at the claims and between the hospital and our OB the total charges for my son were $22,000. And that's for a normal birth with an epidural. That is completely insane. I think the total charges were something like $7000 in Charlotte for our daughter. Check Amazon for stuff, and even the Zwift Racers Facebook group. They have some good ideas and cheap items out there. I'd also recommend cleaning that box! Also, it wouldn't hurt to say hi in Zwift. I've lined up twice with you in races and was screaming your name to no avail. Those pictures are giving me anxiety. We had one kid in NYC and just had one at Stanford. Both bills were like 60k. We paid 5k out of pocket the first time because our insurance wasn't that good, this time since my wife works in tech and has great insurance and benefits, we actually got paid to have the kid. That's crazy. For relatively normal births? $60k for that is outrageous. I thought it was usually around $10k, but maybe that's just the portion that people end up paying, I'm not sure. Yikes. I can definitely see a 6 week NICU stay getting expensive fast. Hopefully he's doing well now. Turned 7 on Sunday, he's getting to be a big kid! 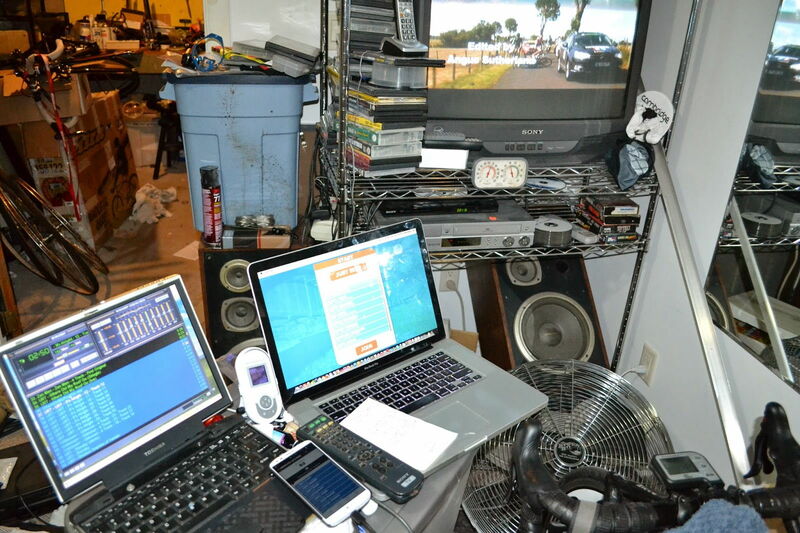 Here's my bike cave setup at the moment, currently have my cx bike on the trainer. To the left of my bike is an old dresser we used as a tv stand and now serves as a side table for me, plus I put a portable AC on the stand during the summer. Makes for a good place to leave stuff within reach. 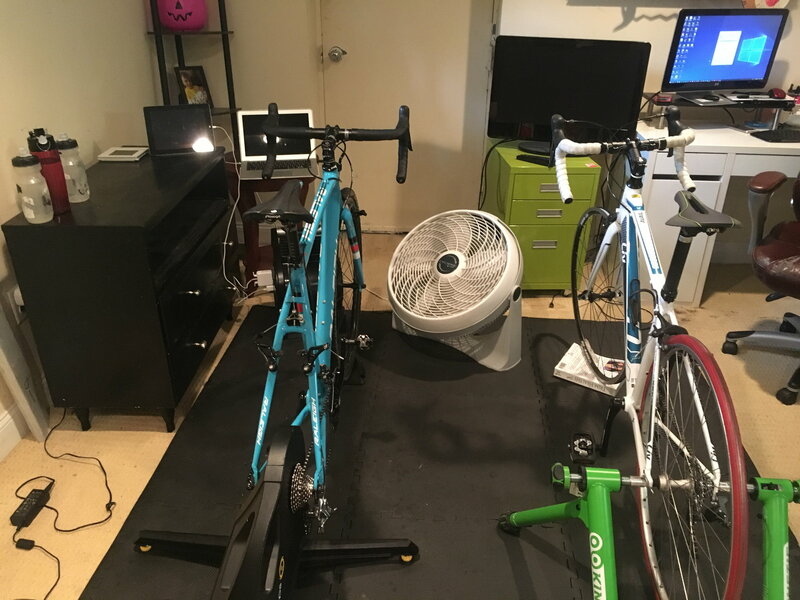 Currently using my wife's macbook air for zwifting (better graphics than my ancient core2duo desktop now there), and I sometimes use that old vizio tv on the green filing cabinet as a monitor for zwifting purposes, although it's just for visual distraction, as I train indoors with trainerroad from my ipad. My wife recently got some cheap workout tiles and I really like them, except they are a bit light so they are already dented from the trainer and bike shoes. Overall, pretty happy with this setup, would love a better PC of my own (12 years is pretty long in the tooth, but it really runs fine for the vast majority of things I do) but that's nitpicking and I'm not super serious about the zwifting at the moment. been there. our 6 y.o. was born as a "micro" preemie. he was born at 26 weeks and spent the 1st 3 mos of his life in NICU. then after released, went back in for a week. after that, he had an emergency situation that got him a helicopter ride over the Nation's Capitol and an emergency surgery + another week in a another hospital. he had at home PT for another few months. we never tallied all the bills, but I'm confident they're pushing or possibly exceeding 7 figures. that doesn't even go into the prenatal stuff, which bordered on experimental. Take that insurance company!!! he's nearly 7 now, and perfectly healthy, which our family docs still actually marvel at with surprise. we were very fortunate to have had access to the health care we did. @cdr, if you fell off your rollers, would anyone be able to find you? ha, no kidding. But I like to use myself and my situation of how the health insurance market should work, I spent my 20's employed and paying premiums to my insurer and was healthy-ish (I unfortunately spent more of my 20's overweight than in shape, but fortunately wasn't ill and didn't even routinely go for annual physicals) so I helped pay for care other people got. Once my son was born, I was in a position of needing the coverage and was thankful to have it, and some other healthy people helped subsidize it. So whenever I hear people talk about not wanting to pay for coverage they "don't use" I cringe. To be fair, I have a level of understanding, both through education and work in the field, that a lot of people don't, but it's still kind of basic insurance 101. I'll have to cut myself short because this can veer into forbidden political chatter! As far as tv, I'd recommend getting an insignia tv at best buy, 39" for $180. I have a smaller one in our bedroom and, while I'm no expert in tv picture quality, it's pretty darn good. Here's the weird thing. I first heard Laurel on twitter, through my iPad. Then the local news did a thing on it and it sounded like Yanny. Freaky. Any more crap and you could be on an episode of Hoarders.